Snappy, classically analog envelopes with visually intuitive controls. 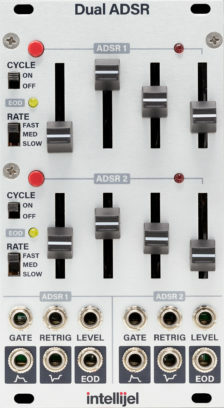 Add trigger buttons, cycling and a variety of control voltage outputs—then double it—now you've got the Dual ADSR. We tend to prefer sliders for our envelope generators because they provide a clear visual representation of the modulation shape. This circuit is based in part on the Roland SH-101 / System 100m design with several enhancements. Dynamic control of the envelope output level.